Birmingham’s bid for Amazon included placing large Amazon packages all over town. Image courtesy of IN Birmingham/ Twitter via The Architect’s Newsletter. Amazon has received 238 proposals from cities and regions in 54 states, provinces, districts and territories across North America. The Architect’s Newspaper reveals how different cities are bidding to be the home of HQ2. With construction in Denver, CO surging, The Colorado Real Estate Journal reminds designers to approach design with a holistic understanding of how people experience every aspect of their lives. IT and HR both play a significant role in employee productivity, engagement, operational costs, and cultural benefits. Read more from Human Resources Director on how teaming up could improve workplace culture. 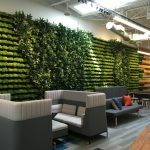 Area Development asked Siemens’ Michael Kruklinski about their intelligent space management and how office configuration can play a role in employee satisfaction, productivity, sustainability, and the continuity of operations. 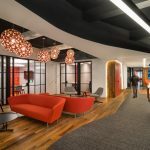 According to a new study from National Business Furniture, office design and aesthetics play a huge role in recruiting young talent. Get the full scoop from Contract Furnishings News. The new book Cultivating a Creative Culture details how businesses can make their office environments more conducive to employees doing their best work. It covers everything from healthy office space configuration, to areas set aside for creative problem solving, to the value of Swedish ‘fika’ and spots tailored to pausing for a coffee break.